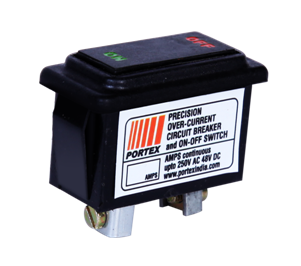 PORTEX-Precision is a miniaturized precision thermal circuit breaker with a ROCKER actuated ON/OFF switch. This provides the dual benefits of operating the it as a regular ON/OFF switch as well as an overload circuit breaker for the protection of equipment. It is connected in series with the load and protects against over-current caused by any fault condition in the circuit or equipment, overload, misuse, voltage fluctuation, etc., by tripping and breaking supply when amps. load increases beyond maximum specified limit. This Circuit Breaker is Patented in India and is fully designed, developed and manufactured in India. No Chinese components have been used. Operating Mechanism: It has a reliable over-centre trip mechanism, actuated by a separate bimetallic heater system, housed in an insulated compartment. This design results in minimal heat loss and fast sensing of over-current, thereby, ensuring extremely rapid and accurate overload performance and complete safety during fault conditions. In the event of an overload, the normally closed contacts open with a “snap action” to interrupt the current, and the ON/OFF rocker switch moves to the OFF position. Pressing this ON/OFF rocker switch to the ON position resets the over-centre trip mechanism and restores the supply. 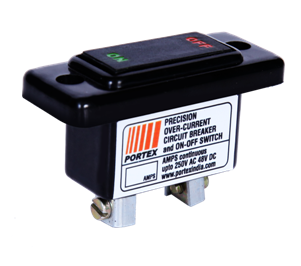 PORTEX Single Button Circuit Breaker is a single pole, precision thermal circuit breaker with a push to reset button on top. This circuit breaker has a threadneck panel mounting arrangement which can be fitted in any 9mm hole with the plastic knurled nut. It is the same as the Rocker Actuated Circuit Breaker. The contacts open and close with a “snap action”. The push button clearly extends out when the circuit breaker trips and pressing it resets the trip mechanism and restores the supply. Designed for Dual Function Specially designed dual function device which can be used as a regular ON/OFF switch as well as an overload protection switch. Longer Life with Special Switching Mechanism Specially designed for continuous use as a manual switch, over a long period of time. MCB type circuit breaker get damaged very quickly after repeated usage. Designed for Extremely Low Current Ratings Specially designed for very low current ratings of 0.5A, 1A, 1.5A, 2A, 2.5A, in increment of 0.5A till 20A. The lowest MCB current rating available is 6A. Greater Accuracy in Precision Controls PORTEX-Precision circuit breakers operate within overloads of 20%. Throughout the world, the industry standards of various manufacturers of thermally operated circuit breakers specify a “must trip” point of 35% overload or more. In comparison, our devices are calibrated to carry rated current continuously but “must trip” within an overload of 1% to 20% at 30 degrees C ambient temperature. Increased Reliability due to no Mechanical Latching Specially designed with no mechanical latching for holding the contacts in the closed position. The contacts stay in the closed position due to the over-centre mechanism, which snaps open the contacts when the bimetal heats up and changes the over-centre angulation. Hence, the problems of unreliability due to latch wear-out and change in latch release characteristics due to friction are eliminated. Mechanical latching in MCB circuit breakers makes them extremely unreliable. Protection of all industrial, commercial and domestic equipment against excessive amps. load. Motors, pumps, electrically driven equipment, appliances etc. protection against over-current due to overload, stalling, low or high voltage, failure to start, locked rotor, single phasing etc. All power supply equipment, e.g., UPS, Invertors, SMPS Power supply, Voltage Stabilizers, etc. Portex precision circuit breakers are thermally operated devices fitted with a bi-metal actuated tripping mechanism which function upon deflection of the bi-metal when it heats due to increased amps load. Several unique patented design features in our devices prevent dissipation of heat generated in the bi-metal, which is contained in a chamber. This results in increased sensitivity and consistent accuracy of trip current load. 1. 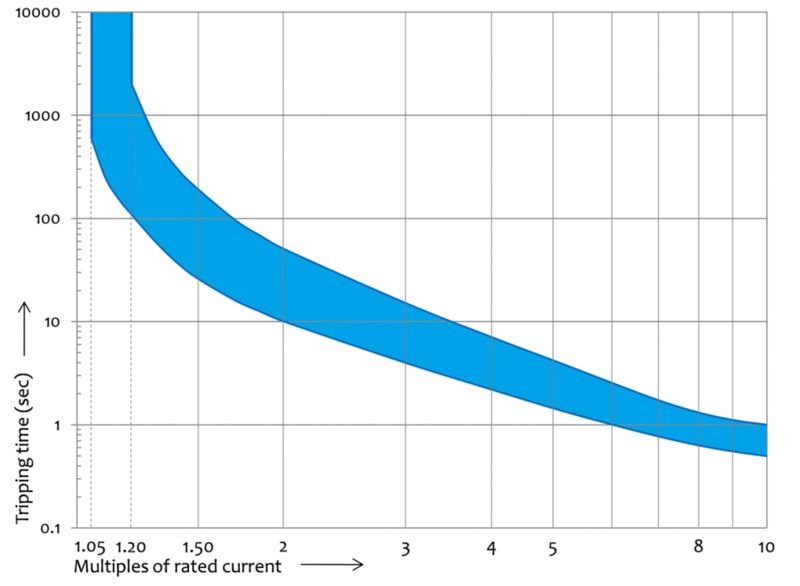 Tripping takes place within an overload of 5% to 20% of the maximum continuous current rating. For example, if the maximum continuous load is 10 amps., then the circuit breaker will not trip up to 10.5 amps., (i.e. 10A + 5% overload of 10A = 10.5A), at an ambient temperature of 30C, but will definitely trip at a load of 12 amps. or less, (i.e. 10A + 20% overload of 10A = 12A). All circuit breakers of other manufacturers internationally operate within an overload of 35% as compared to an overload of 20% for Portex circuit breakers. 2. Since our circuit breakers are also designed to not trip at 5% current overload, i.e., they will hold and operate continuously at up to 5% overload of the rated current. This ensures that there is no nuisance tripping due to starting loads, in-rush currents, short duration overloads, starting surges or other short duration voltage fluctuations and load variations, which are self correcting and do not damage the equipment. Severity of Overload: With increased amps. load, the time taken to trip reduces, i.e. higher the overload, lesser the tripping time. Continuous slight overload will result in extended tripping time. Cold Condition: At cold condition, i.e., when the circuit breaker is switched on and the initial starting current is at 20% overload, then the tripping time will be longer as the bimetal has to heat up from cold condition. Hot Condition: At hot condition, i.e., when the circuit breaker is already operating at the normal load current and then current increases to 20% overload, the tripping time will be short as the bimetal is already running hot. 4. In both the cold and hot condition, the trip current remains the same. Only the tripping time will be more when switched on from cold condition as compared to hot condition. 5. Data on the relationship between trip time and load, indicating upper and lower limits of tolerance within which the devices operate is presented in the below graph.